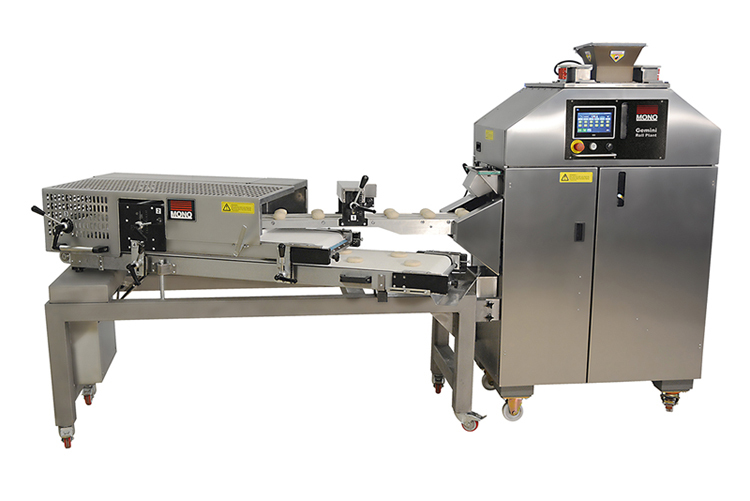 Mono Gemini Two Pocket Roll PlantThis compact unit takes the strain and effort out of producing a range of bread rolls by automating the dividing, rounding and moulding processes, producing up to 3,200 rolls per hour with just one operator controlling the roll plant. With its small footprint, and ease of operation, the Gemini Two-Pocket Roll Plant provides the ideal solution for small to medium sized bakeries which need high volume output, but have minimum floor space. The fully-automated Roll Plant expertly controls the dividing, rounding and moulding processes enabling a wide range of rolls to be produced with a weight range of between 30-100g (other weight ranges are available on request). With the addition of MONO’s Roll Forming Unit, the variety of bread rolls that can be produced is significantly expanded to include flattened hamburger rolls, petit pain and elongated hotdog / finger rolls. The combination of the Gemini Two-Pocket Roll Plant and the Roll Forming Unit provides a genuine ‘one-machine-does-it-all’ solution for the majority of bread roll manufacturers.